Here are some suggestions on race strategy for Colorado Trail Race. Much of this is common to all multi-day races, while some is CTR specific. In stark contrast to an individual self-supported time trial, CTR is a race. That’s what the “R” stands for. However – do your best to stick to your plan for pacing early in the race. It is fun to start with a big crowd of bikepackers, no doubt! On the flip side, it is difficult to stick to pace goals if you are chasing hard after the leaders; competitive drive can make it hard to stay in tune with the body’s signals. Stick to your plan; be confident in it because it WILL work. Constantly assess your current situation re: water, calories, energy levels and stay on top of it all. Think ahead – where to bivy, where your next water source will be. Despite the race setting, it is still an individual pursuit. Revel in it! Everyone has an ideal window of time in a given 24 hour period to make forward progress. Do you like to go to bed early and get up early? Or are you a night owl and like to sleep in? The fastest racers are getting 3-4 hours rest each night in CTR, and much of the field is getting more like 6-8 hours. Where those 3-8 hours occur is important for your daily flow. If you don’t know what is best for you, test and discover it in your overnight excursions. You may need to modify your natural flow/rhythm to ensure you hit resupply points when they are open. You’ll likely be pacing all your race efforts by PE. Keep the pace such that you avoid rapid/ragged breathing. Once that begins energy reserves are being used at an unsustainable rate. Walking/hiking is fine and happens often in CTR. Moderately paced forward progress! Give special attention to pacing the first day. Everyone burns it hard the first day and it is really evident in the blogs as the “day 2 slump” seems to prevail. The race starts at just over 5k’ and climbs to nearly 12k’ – much of that first day is climbing! Ride a pace such that you can converse in 8 word sentences for most of the first day. You can’t really under pace the first day – there is so much trail left to hammer beyond mile 100… There are many, many places where you will walk/hike. Sometimes – like segments 14, 16, 17, 22-23 and 25 in particular – there will be sections where you’ll ride for a short time between numerous dismounts. Learn to dismount before you are forced to, maintaining forward momentum. There may also be periods where it is simply faster to stay on foot rather than burn the matches required to stay on the bike. 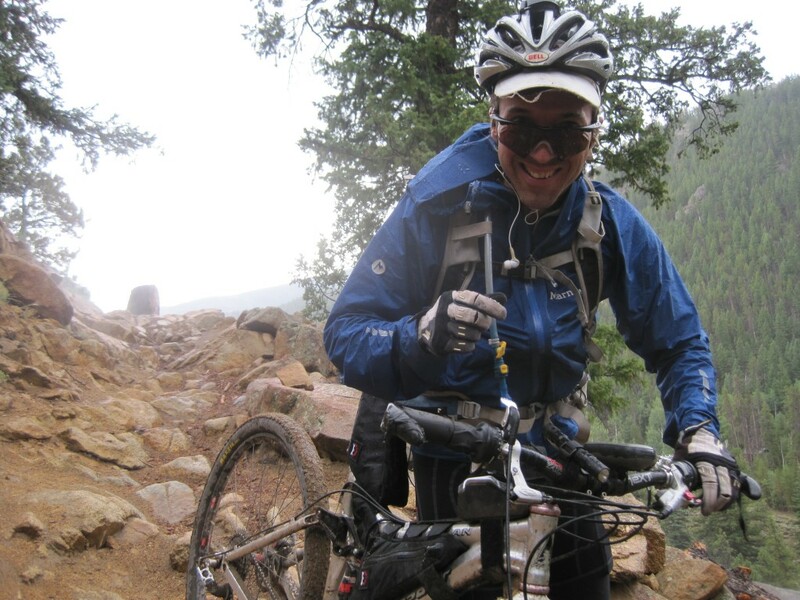 Develop the skills in training to hike a bike from either side, and to dismount/mount from either side of the bike. Generally speaking, there are going to be periods when you feel great, on top of the world with no PE, and other times when you’ll wonder what you are doing. You will question your sanity at least once. You can keep the negative emotions at bay with good pacing and fueling…but they will still find you at some point. 470 miles is a long race! Keep a cool head and work through whatever challenges face you. Be open-minded and creative. Good fueling, pacing, planning, and equipment choices improve your odds of maintaining flow for the duration. Have a solid resupply plan in place, including a list of supplies you will need at each planned resupply point. Practice this in training. Leadville, Buena Vista, and Silverton are good resupply points. Spend as little time in towns as practical as they tend to be big time drains. Hotels are wonderfully comfy, have showers, and are time consuming. Consciously weigh the options using your race strategy and goal as the ultimate yardstick. The resupplies in BV and/or Mt Princeton Hot Springs need to be enough to make it to Silverton, and that can take 3 (or more) days. Go to http://trackleaders.com/ctr to see the race splits from prior years. From these make your best guess as to how long it will take to get to Silverton to know how many calories you’ll need. This crux decision plays a large role in the race outcome. Insufficient calories means a costly detour to Lake City – anyone in that situation last year rode the old Cinnamon pass detour. Riding in the company of others is generally accepted but it’s a tricky gray area. As the genre evolves, there are many differing opinions regarding ethics. The most common area where things get gray is in regards to interactions with others, so be sure to read and understand the race rules – not the simple 3 sentence version, but the full FAQ. The former is open to interpretation, and the latter clarifies those interpretations as seen by the organizer. NSAIDS are common these days for treating trail-side ailments. Go for natural pain relief whenever possible as the NSAIDS come with a good bit of risk (stomach issues and they are hard for your kidneys and/or liver to process). If you have to use NSAIDS don’t exceed suggested dosages, make sure to remain well hydrated, and take with some solid foods to avoid stomach issues. Check out http://www.basecampmd.com/expguide/amspremed.shtml for references to potential uses for Music is a potent pain reliever. MP3s are ideal for this purpose. Music has also been shown to increase performance, a double benefit. MP3 tip: start collecting favorite playlists months in advance of the race. Listen to them sparingly, especially in the 4 weeks prior to the race. Unleash them when most needed for performance or pain relief. Recovery is a big part of pain relief – and performance enhancement. Seek the lowest elevations available for your bivvies. Consume a premade recovery mix including 10g of glutamine prior to any bivy or extended stop. My preference is First Endurance Ultragen (http://www.firstendurance.com/ultragen.html) but anything similar will work. Stay well hydrated. Test any planned pain relief strategies in training prior to CTR.